The Chinese Exclusion Act of 1882 had a profound influence on immigration during and beyond its 60 year period of enforcement. This act barred Chinese workers from coming to this country, and prohibited Chinese nationals, who were already here in the United States as laborers for American railroads and other industries, from ever gaining citizenship. Join us for a screening of the abridged 30 minute version of this documentary. Learn about the origins, history and impact of the first US immigration law to target a specific nationality of people. A Q&A session will take place directly after the screening. This program is presented in partnership with the 1882 Foundation, a Washington, DC cultural advocacy and public education agency working to broaden public understanding of the history of Chinese in America and tell of their contributions to the formation and enrichment of the American nation. Please RSVP for an event reminder. 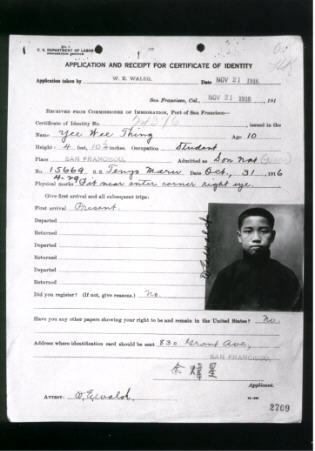 Image: Certificate of identity issued to Yee Wee Thing certifying that he is the son of a US citizen, issued Nov. 21, 1916. This is necessary because of the Chinese Exclusion Act. Source: wikimedia, used under creative commons.